This article being here might go against some of the intentions of Spotted by Locals, but in reality, although part of this place is often overcrowded, there is a part of it, its essence and reason of existence, that ironically is not crowded at all! 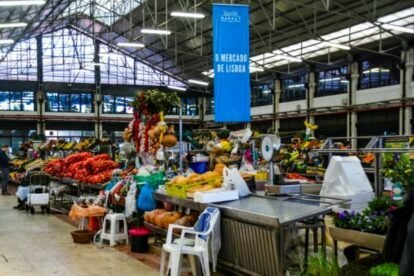 Let me explain: this market has been one of the central markets of Lisbon for all the fresh Portuguese produce for years! Freshly caught fish, seasonal vegetables, a world of flowers and old school butchers. This is the soul of this market. Years ago, Time Out took the central court of this space and turned it into a huge touristic food court, completely overcrowded most of the time. The ironic part? Most people aren’t even aware that in the hallways around this court there are a number of stalls, shops and people that have sold fresh ingredients and products for decades! I grew up coming here with my mother to buy flowers for our house, and I take joy and pride in shopping there, at the organic shop with plenty of incredible foods, and at one of the fresh fish stalls. That’s why I love this spot and invite anyone to visit, meet and shop at this market, for it’s architecturally beauty, with plenty of genuine and traditional sellers. And make sure not to step into the food court. It’s not worth your precious time!